This famous name of habitational origins, is found in the Annals both of Britain and the United States of America, where it made an early entry (see below). The origin however, is Olde English pre 7th Century, the derivation being from "hals" meaning a neck of land, plus "eg", an island. This was often an island formed in a river, rather than at sea, as in the villages of Halse in Somerset and Northampstonshire. 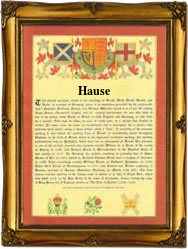 There are a number of alternative or variant spellings including Halse, Halsho, Halso and Hause, the former being relatively popular in Devon and Somerset. Six Coats of Arms have been granted to Halseys, the earliest for the Halseys of Devon, being a gold field charged with a fess between three griffins' heads, all in Hack. Amongst the earliest settlers into America were Joseph Halsey, aged 24 yrs., who left London on the ship "Elizabeth and Ann" on May 6th 1635, and Richard Halsey, aged 13 yrs., who embarked on the "Hopewell", on July 28th 1635, both ships being bound for "Virginea". Admiral William Halsey U.S.N. was the victor of The Battle of Midway in 1944. An early recording in England was that of Widdow Halsey, who married one Whorwood Shadwell at St. Paul's, Benet's Wharf, London, on October 5th 1620. The first recorded spelling of the family name is shown to be that of Richard Halsey, which was dated August 27th 1581, a witness at the Church of St. Augustine, Watling Street, London, during the reign of Queen Elizabeth 1, known as "Good Queen Bess", 1558 - 1603. Surnames became necessary when governments introduced personal taxation. In England this was known as Poll Tax. Throughout the centuries, surnames in every country have continued to "develop" often leading to astonishing variants of the original spelling.